Who actually wants to be a politician - like really? Who wakes up one day and decides that it’s the career path for them? And does that happen with other jobs? Do we decide and have a clear path for where we want to be or do we just stumble into it? Even if we had our hearts set on being a politician, what is the actual process? For the past few weeks Free Radical have had the privilege to collaborate with Birmingham Repertory Theatre's Young REP Lightpost group which is a company of young African-Caribbean men based in Birmingham who seek to actively challenge some of the social stigmas associated with young black men. This has included weekly workshops, led in collaboration with Philip Morris (Youth Theatre Director, Director of Lightpost) to explore some key questions around democracy and our relationship to it (if there even is one). Over the process we have covered so many questions across various topics and through hour long chats, workshops and laughter we have explored identity, place and politics. It has been quite a special room to be in every Wednesday evening, full of provocative thoughts and refreshing ideas. We spent a lot of the early workshops reflecting about who we are and our relationship to Birmingham and the different communities we may or may not be a part of. It was here that was a real turning point for us. We examined our sense of belonging to communities and no one in the room felt they fully belonged to a particular community. We started to pick this apart as a group and ask why - it seemed to come down to space. The group as a whole felt there was no space for them to “belong”. A lot of the group spoke about fond memories of youth clubs across the city that suddenly wrapped up activity or closed down. When we looked into this more it began to reflect wider issues around the country with heavy cuts to youth services nationally. This naturally lead us to discuss politics and we discovered the group deemed politics “not for them” or had little interest in actively engaging in politics. Again, we picked apart why, it became apparent the answer was in representation. The group felt that politics is another language or an activity for an extremely privileged few to be “involved in”. They just felt alienated by the whole process. In complete contrast to this though, the group of young inspiring and passionate men regularly voiced their political opinion with passion and rigor about issues like Brexit, youth service funding and race relations; that wouldn’t look out of place in the House Of Commons, if the House Of Commons wasn’t actually full of soundbites and jeering. It hasn’t just been debate and play though, we’ve been working really hard to bring together all the topics and questions that we’ve explored, to put together a performance piece with elements of interactive play, deep discussion and self reflection; to question and provoke thoughts about how politics can be more effective for all of us. On Wednesday 11th July, the work will culminate in an event devised and written by the Young REP Lightpost group which will include an element of discussion. There will be food after the performance to make sure our minds are fuelled for further critical thinking. What is the relationship between decision makers and the young people they represent ? 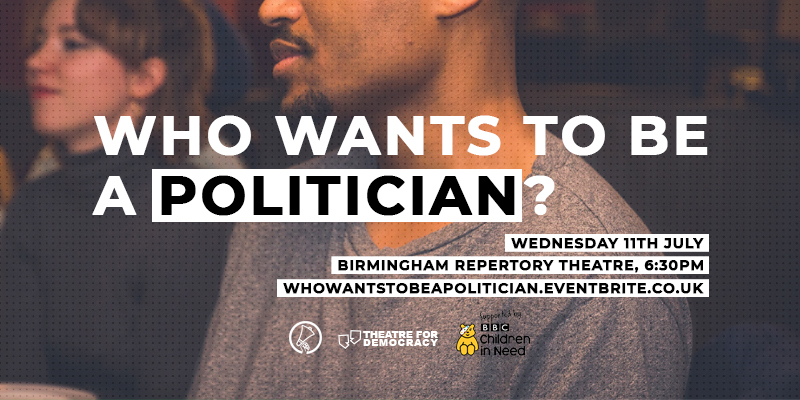 We would love to invite you to join us for "Who Wants To Be A Politician" on Wednesday 11th July at Birmingham Repertory Theatre from 6:30pm, where we will try our best to get to the bottom of these questions in an evening of food, thought and play. Written by Jay Crutchley, Creative Practitioner at Free Radical. For more information about Theatre For Democracy visit beatfreeks.com/theatre-for-democracy.